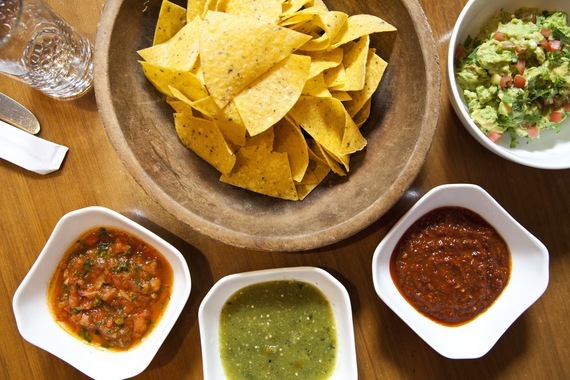 Salsa, a refreshing Mexican condiment that goes great with anything from tortilla chips and tacos to breakfast burritos and enchiladas, typically includes a mix of chopped tomatoes, onions, chilies, herbs and spices. Offered in both cooked and raw forms, a salsa’s heat can range from mild to extremely hot depending on which peppers are used — jalapeño (hot), serrano (hotter) or habanero (hottest). Guacamole, another Mexican staple, is a creamy avocado spread. Like many salsas, which are filled with vitamin C-rich tomatoes, guacamole is a nutritious, delicious choice that’s rich in heart-healthy “good fats” (omega-3s). The rich, vibrant green dip is traditionally made with mashed avocado, onion, chilies, lime and salt, and is right at home next to a big basket of crunchy tortilla chips. Simple salsas and guacamoles are awesome, but there are also plenty of add-ins — fruits, veggies, spices and even proteins — that can turn even the most straightforward versions into culinary adventures. Here are 9 spots adding a little something extra to their guacs and salsas. Posted in Eat & Drink, Press and tagged El Toro Blanco, Guacamole. Bookmark the permalink.